As the summer weather rolls in, everyone wants to be outside enjoying the heat. For this week’s One Tank Trip, we are taking a drive out to scenic Hocking Hills. Cincinnati to Hocking Hills is 135.5 miles which is about 2 hours and 22 minutes in the car—and once you’re there you’ll find it well worth the trip. Hocking Hills is home to some of the prettiest views in Ohio; from the waterfalls to the caves, it has it all. This special place tailors to everyone niche. Ones who love horseback riding, to the early morning hikers or the outdoorsy campers and for the ones who love the small town hospitality that Logan, OH brings. Probably the most well-known features are the striking waterfalls carved into the landscape throughout the area. In the southernmost region of Hocking Hills is Ash Cave; the best feature of the entire park, in my opinion. Ash Cave is the largest, most impressive recess cave in the state. The most popular of all the Hocking areas is Old Man’s Cave, located on State Route 664. The Gatewood Trail connects three park areas; Old Man’s Cave to Cedar Falls to Ash Cave. This same trail has been designated as part of Ohio’s Buckeye Trail as well as part of two national systems: The North Country Scenic Trail and America’s Discovery Trail. 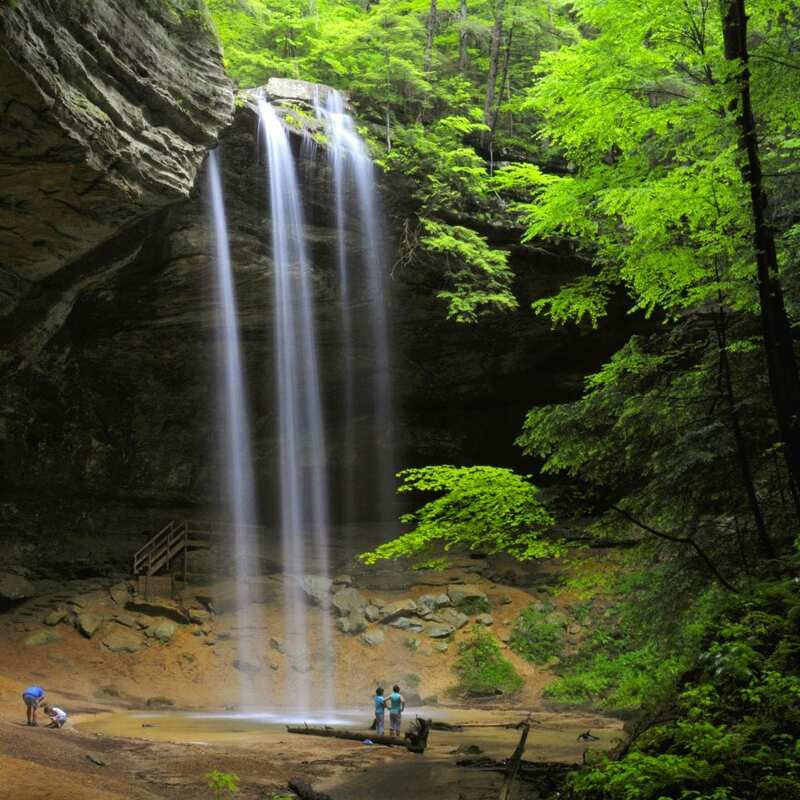 It is well worth it to make a weekend out of your trip to Hocking Hills. The cabins are reasonably priced, quaint, charming, but equipped with amenities to make even your most wilderness-averse family members feel at home. Guests can easily find cabins with full kitchens, fireplaces, TVs and most importantly- no cellphone service for a few miles around! This is a great opportunity to “unplug” and really enjoy the nature. The best thing about these attractions and hikes is that they are free. A great family weekend doesn’t cost an arm or leg when going to Hocking Hills. Weekends are far more popular than weekdays for traveling. The rate for cabins increases during the weekends rather than weekdays and also depends on the time of the year. Each cabin rental site provides pictures, reviews, descriptions of the cabin and a map featuring the nearest trails. The experience of Hocking Hills is one that everyone should partake in. Stay tuned for more cities and attractions featured in our One Tank Trips blog series!